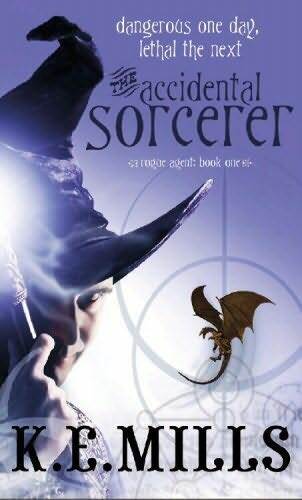 The first thing to say about The Accidental Sorcerer is than it's light fantasy - fun fantasy. It neatly bridges the divide between light and comic fantasy, so don't expect an Erikson or Martin here: there's very little grit in this world, but it's enjoyable nonetheless. It's set in a world that seems, varyingly, industrial and post-industrial: but with magic replacing a great deal of technology. For example, telephones are mostly replaced by crystal balls - you call an "etheric frequency" instead of a number. Actually, from the mundane description above, one certainly wouldn't guess that The Accidental Sorcerer can manage some great twists. However, it's the characters - not to mention their repartee - who drive the story. Gerald - a good-natured but slightly incompetent wizard. Reg, his constant companion - a talking bird with a concealed past and a level of tact approaching zero, especially when addressing Lionel. Melissande - a princess who is the antithesis of everything expected of royalty, and exceedingly bossy. And the side cast of characters like Rupert, (fixated on butterflies - including some that happen to be vampiric) Lionel, and Monk adds to the humour, and, as the book continues, the drama. Because The Accidental Sorcerer certainly succeeds in both drama and comedy, a rare feat. That said, some aspects don't make sense. Why is transforming an animal a spell that sets alarms off across the globe, and one that requires a genius? How is the thaumaturgy described so advanced in some areas, but very, very ordinary in others? It's certainly a good book, but minor flaws, and the fact that it's a fast, fun read - but not a great one - hold it back slightly. You'll quickly finish your copy, though! If you are looking for a Car battery, Rihal Battery is the perfect way of buy car battery online in jaipur at best price and free home delivery. Guest Post: What Catches Your Eye in Fantasy?